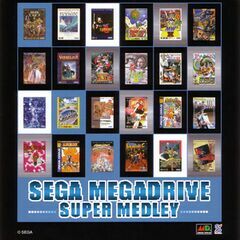 Sega Mega Drive Super Medley is an EP that consists of three medleys with musical selections from 24 Mega Drive titles depicted on its cover. Track 1 is an arrangement of these themes produced by Takayuki Aihara, whilst track 2 is the same medley albeit utilizing the original tracks. Track 3 is a different arrangement produced by Hideaki Kobayashi under the alias Dr. COVA. Alien Soldier, OutRun, Space Harrier II, Bare Knuckle, Crying, Monster World III, Ristar the Shooting Star, Super Fantasy Zone, Pulseman, The Super Shinobi, Ecco the Dolphin, Gunstar Heroes, Vermilion, Golden Axe II, Shining and the Darkness, Shining Force, Landstalker, Phantasy Star III, Phantasy Star II, Battle Golfer Yui, Shikinjou, Ninja Burai Densetsu, Rent-a-Hero and Monster World IV.